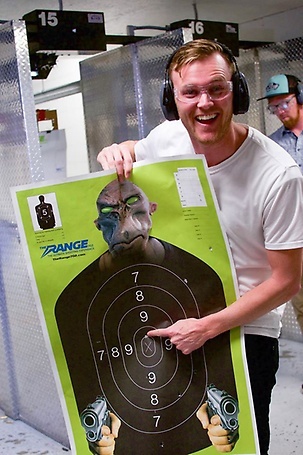 The Range 702 is the ultimate Las Vegas shooting experience! Boasting 17,000 square feet of shooting lanes, gunsmiths, seasoned instructors, retail and rentals, a snack bar and an arsenal you’ll have to see to believe! All guests receive a free T-shirt and complimentary round-trip transportation from the Las Vegas Strip and surrounding areas. Click Here to purchase shooting packages with Best Price Guarantee! Click, click, BOOM. At The Range 702, you’ve got the right to bear arms. But we wouldn’t advise it because those empty shell casings can be sizzling hot (badum bum — we’re writers — of course we know the difference between “bear” and “bare”). But seriously, you know you’re doing something right when you’re a multi-award-winning gun range. 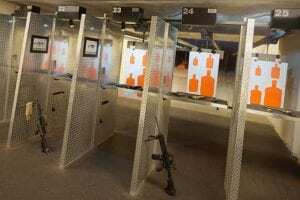 One of the most prominent indoor shooting ranges in southern Nevada, this four-tiered facility is rated five stars by the NRA and is also a winner of the Concierge Choice Award. You know what that means: they’re pretty much considered industry bad asses. With full-time gunsmiths, training courses, a retail store and firearm rentals, this place will have gun enthusiasts drooling all over themselves. And when you’ve got no saliva left in your mouth, they’ve got you covered with a full snack bar to refuel before you reload. At The Range 702, they bring out the big boys, as in machine guns and military-grade weapons, and let guests pop off rounds faster than they can count them. You wouldn’t buy a car before you drove it, so why would you buy a gun before you shot it? Whether you’re in the market or just blowing off some steam, guests can rent the full spectrum of firearms from pistols to Uzis for around $50. Hosting a bachelor or bachelorette party? The VIP lounge has private shooting lanes that come with a hostess, pool table, flat-screen TV with surround-sound, catering and your own range host. Whether you’re a bonafide sharp shooter or a complete beginner, The Range 702 has got you covered! Located on 5999 Dean Martin Drive, just a few minutes southwest from the Las Vegas Strip. From the Strip: Head west on Tropicana Avenue. Turn left on Dean Martin Drive. The Range 702 will be on your right, next to Larry Flynt’s Hustler Club.